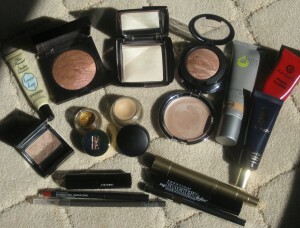 This post is dedicated to the makeup products which are currently in my rotation. As all makeup addicts can attest, our attention is constantly swayed by the “new kid” on the makeup block. A monthly update is not only advised it is required!! Enjoy. Pretty good eyeshadow base, not the best. Still looking for the one. Currently testing a new one. Will keep you updated! My favorite bronzer…wish they would make this a permanent item in the line. Really like the way this livens up my sallow complexion! Browny rose blush, also used as a blend out color for a smoky eye and as an all over lid color! The color is too dark/orange and the coverage is minimal, but makes a satisfactory primer. This mineral based foundation has great coverage, moisturizing and is HD, however, it does not last all day for me. High coverage and super long lasting, however, very drying for dry skin. Add some moisturizer to this or mix with another moisturizing foundation of your choice! No fuss, no muss color. Great on days when I need to brighten my tired eyes! I use this little pot of gold as an eyeshadow, base color for powdered eyeshadows, and for my inner waterline liner!!! Cannot say enough good about this product! This is an eyeshadow base color to even out my eyelid coloring and brighten any powder eyeshadow that is applied on top. You will still need a general base like TF to prevent creasing. Great base for any powdered highlighter. I love Chicory (pencil form) and Red Enriched (Cremestick liner..automatic) and Nice n’ Spicy (Prolong Wear liners)..
Beautiful liquid lipsticks which are moisturizing, long lasting and a great value. These are great as toppers for drier formulas. Review coming soon! Great match to my eyebrow color, very subtle. Great for lengthening and separating the lashes. Great for volume. I like to add this mascara as a second layer after L’oreal. Fast, cheap, and easy liner. Great in the cooler months, summer time requires a waterproof formula. Makeup would tell me I am a very fickle and highly distractible woman. My loyalties are constantly called into question when it comes to makeup products. I can’t help it!! Hence the monthly updates 🙂 Be well and stay safe.